During the 2060s era, there were quite a few tyrannies in operation on Earth-Prime, including both the first two you mentioned and several others (perhaps most notably the fact that part of the world was conquered/occupied by WH40K space marines.) Great character, and I take it you're watching The Price of Smiles. The Labrynth was the name of a Shadowy organization in an excellent web novel, Worm. Is that where you got that name or coincidence? I'm working on Morningstar, solar powered symbol of the Resistance. Mechanically I'm looking at a flying blaster type. I've updated Pratfall's background to reflect his power source being divine magic. Anyone's bet as to whether that's still where it comes from given whatever nature of a world we're in. 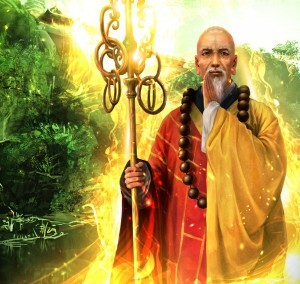 Senso was the head of the monastery in the high peaks of the Shambala land. Ages ago he had ascended to enlightenment at the age of 90, unlocking the secrets of his body, as well as those of others. From that day on he did not age a single day, his body was already as strong as steel, and so it remained, unchanged by the decades. He remained secluded in the monastery, teaching generations of monks, hoping to ease the troubles of the world by sending his pupils out to help. The world however changed outside the secluded peaks of the monastery, and the Shambala found themselves ill prepared for the new challanges. With time it became evident that chaos and conflict would not cease. It dawned on Senso that he himself needed to cut chaos at its root and restore balance to world, that he was the one that needed to go outside and see the world as it was now. He found himself in a strange world, a world plagued with imbalances and chaos. The order and balance needed to be restored. Like a beacon of hope and light, but also a harbinger of despair and darkness, Senso the Master of Shambala, the chosen of Buddha, advanced through the world, balancing the waves of light and darkness with swift controlled movements. Sometimes it was a blow of his deceptively thin fist, that destroyed an invading army of robots, sometimes it was heavenly light that saved a mortally wounded ruler, or a vision so perfect of the land beyond that made men drop their weapons and return to their homes, abandoning all will to fight. But with such an insurmountable quest ahead, would the head of the Temple be ever able to bring balance to this world? Pacifist	:	Despite being able to harm others in various ways, he firstly resorts to non aggressive measures, such as the Visions of the Land of Ethernal Bliss. Enlightened	:	He might sound lofty and over the top with his preaching of enlightenment, or people's lack of it. Strength	10	,	Stamina	10	,	Agility	5	,	Dexterity	0	,	Fighting	10	,	Intellect	0	,	Awareness	5	,	Presence	0	. All out attack	1	,	Evasion 2	,	Fast grab	1	,	Fearless	1	,	Imp. Critical	1	,	Imp. Grab	1	,	Imp. Hold	1	,	Imp. Trip	1	,	Power attack	1	,	Prone Fighting	1	,	Trance	1	,	Luck	5	,	Improved initiative	1	,	Interpose	1. Acrobatics 6	(+	11	),	Deception	0	(+	0	),	Athletics	2	(+	12	),	Expertise	0	(+	0	),	Insight	6	(+	11	),	Treatment	0	(+	0	),	Persuasion	0	(+	0	),	Technology	0	(+	0	),	Vehicles	0	(+	5	),	Sleight of Hand 0	(+	0	),	Perception	6	(+	11	),	Intimidation	0	(+	0	),	Investigation	0	(+	0	),	Stealth 0	(+	5	). I'm working on a tactile telepath. I just have limited time in which to work on it, but I should be able to get it up by Monday for sure . Went back and edited Peacekeeper after realizing I drastically overspent on her defenses somehow. She can Taunt now, and she can throw things, so she'll be a little more useful when nothing is in punching range. Still looking for a picture for her, though. Last edited by FuzzyBoots on Sun Feb 10, 2019 5:39 pm, edited 1 time in total. Did some minor cleaning up on Pratfall, but nothing really mechanically different. He definitely doesn't feel like he comes from the same gritty cyberpunk setting as the rest, but then again, that could be half the fun, a dash of color amid the muted greys and browns, flat patterns against the fuzzy neon. By the by, do you have any problem with him using his mimed objects (Create) with his Improvised Weapon skill? Normally, created objects fall under that, but I wanted to be certain of your interpretation. That does seem like the way to go. I decided to shorten the campaign title a bit.